Published on 20. 06. 2011 in comics and cartooning and interviews. 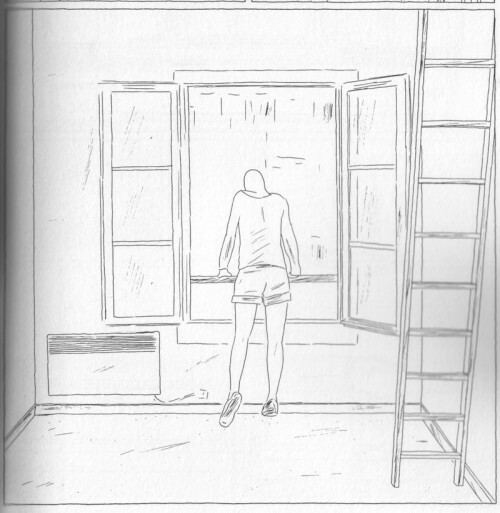 Closed Tags: Angoulême, Florent Ruppert, Jérôme Mulot, The Comics Journal. The cartooning duo Florent Ruppert and Jérôme Mulot are amongst the most remarkable emerging talents on the Francophone comics scene. A two-headed cartoon beast, theirs is an organic collaboration, melding writing and drawing. Their comics are possessed of a strong experimental formalism — elaborate analytical constructions, in which characters move and interact for our entertainment, as if in a petri dish. They both come from a fine arts background, but quickly turned to comics once they were out of art school, publishing short pieces in various anthologies, most notably Férraille Illustré, in the early 2000s. This led them to the seminal French alternative publishing house L’Association, where they released their book debut Safari Monseigneur – an examination colonialism through cartoon vaudeville – in 2005. The next year, it was followed up by Panier de singe (“Monkey Cage”), which weaves gruesome humor from body language and optics, and Le Tricheur (“The Trickster”), a heavily symbolic heist procedural, and Sol Carrelus, a gothic masquerade in 2008. American readers might know them best for their grand stairway in Kramers Ergot 7. In 2009, they published the first in a multi-part series, Irene et les clochards (“Irene and the vagabonds”), which contrasts one woman’s personal rage and isolation with the issue of homelessness endemic to any big city, filtered through a meta-layer in which the artists themselves are contracted to narrate her experiences. More emotional in tone, it promises a new direction for them. There is an element of performance to their work, a playful complicity with the reader that lures one into uncomfortable places. This interaction is often quite concrete: Gogo Club (2007) in part collects a number of cartooned encounters based on conversations with readers at their signings, while “Le Championnat de bras de fer” is an online effort uniting a number of the cartoonists’ colleagues for small jam strips based around a virtual arm-wrestling tournament. 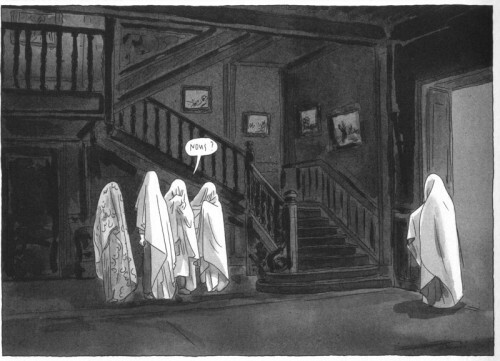 Their most complex work in this vein to date was the “Maison close” (“The bordello”), a controversial online jam comic commissioned for the 2009 Angoulême festival by its presidents that year, the cartooning pair Dupuy/Berberian, in which Ruppert and Mulot united a large number of cartoonists in a virtual whorehouse — the women playing prostitutes, the men their johns. (It was published in book form in late 2010). The present interview is a second take. It was conducted at that same festival, but because of technical problems, it was written down from sparse notes and memory, ably assisted by Ruppert via e-mail. It was originally published at tcj.com on February 1st 2010. I’d like to start by getting an idea of what led you to comics. You both went to art school – what did you do there? R: We didn’t do comics, at least not in school. I was primarily involved in contemporary dance, but also video installation and performance. M: I did a variety of things, including video, sculpture and installation art. Why did you choose comics as your medium instead of some of those activities? R: Comics is a comparatively free medium to work in, less encumbered by history. It seems open as a form, with lots of material to work with and explore. And the comics world is smaller and more accessible, more pleasant and fun than the contemporary art world. Your comics are clearly comics, making use of traditional contour line drawing and clear panel-to-panel storytelling, but at the same time you make use of these elements to do things that have rarely if ever been seen in the form. Would you ascribe that, partly, to your other artistic interests? R: Sure, it’s always an interesting challenge to integrate into comics unusual elements. We’re interested in storytelling, but we emphatically want what we do to be clearly recognizable as comics. We want it to be clearly legible. You share this sensibility with a lot of contemporary cartoonists who are simultaneously innovating within the form. Chris Ware would be an obvious example, or David B. Why are you interested in working within the traditional cartoon language of comics, rather than something entirely different and more related to the other pictorial arts? R: We think this form has a lot to offer and want to work within the tropes of the traditional cartoon, even if simultaneously our work is experimental with an ambition to invent new ways of storytelling. When you look at the comics of Hergé or Winsor McCay, there’s a whole conception of the world on display there, with much thought and care put into it. We want to achieve something similar – to create something that is solely possible in comics. In that respect, you seem very much to be in accord with the school of thought that looks back at the early classics. Art Spiegelman had that memorable line “the future of comics lies in their past.” Would you agree? R: Yes completely; I’m not saying that the past is always better, blahblahblah, but it’s obvious for me that comics staked out a special form of expression early on and it’s important to understand that it is a young medium and that the form it has now is different of what it’s going to be in the future. The earliest comics had this energy of being movable in the making. I was specifically thinking of your storytelling approach, which uses only what in film would be called total and half totals, no close-ups or dramatic shifts in perspective. This is very much in the tradition of the early newspaper strip. M: Yes, we’re not interested in cinematic effects. Instead of presenting a conversation between two characters in shot-reverse manner, we prefer to have them both be there, fully visible, next to each other. That way, you can make use of their body language. We would like it to seem much more like a stage play in a small theater than a film. And you seem fascinated with movement, both natural and performative. Especially in Le Tricheur and parts of Panier de singe, where you break down physical actions into their component parts, using many more individual panels than one would normally see, or need in a traditional comic. I was wondering whether this might in part stem from your background in dance? R: Of course. We’re interested in how body movement can convey emotion, how emotion can be conveyed in this more external way, inviting the reader to interpret what is going on. Yes, you have this almost voyeuristic approach to mise-en-scène. It’s as if we’re given a kind of ‘God’s eye’ perspective on your characters. R: Yes, we find this much more fascinating than spelling out what each character is thinking or feeling. We want the reader to invest in the story, to bring his or her own interpretations as to what is going on. You’ve mentioned a connection to Greek drama and its use of masks? M: Yes, when we draw our characters, we draw them with a simple ‘V’ instead of a face. We don’t want the distraction of facial expression, pinning down whatever emotion the character has. Usually in comics, the face is were all the emotions are written; that’s why a lot of cartoonists work with close-ups. When you talk to someone you look at the face and you perceive the movement of his body. We try to work with neutral faces and concentrate on what is expressed by the body. R: In Greek theater, the mark of a good actor was to inhabit the imaginations of the spectators, to invite their own experience, interpretation and emotions and channel them, rather than convey specific motives or emotions. The mask is an important means of achieving this – it obscures the specificity of the actor’s appearance and expression and it is where the spectator must write his own emotions, while taking cues from the actor’s body movement and expression. In this sense, you’re making an interesting connection, I think, because traditional comics seem to me to be one of the few narrative forms that retained the archetypical models of ancient theater through modernism, where contemporary drama, the novel and eventually film were more concerned with realism, or at least naturalism. R: Yes, we’re not naturalists, but we draw bodies in realistic proportions. Yes, you even make this a central part of the premise in Sol Carrelus, where the participants in the masked ball turn into the archetypes from classic horror stories. R: Yes, we like the little masquerades we all play. I don’t know whether you agree, but to me there’s a certain coldness to your presentation; it can seem almost clinical. The reader is placed at a distance from the action, as if he or she were looking at microbes in a petri dish. R: We like to maintain a certain distance between the reader and our characters, and as you said, today’s cultural representations are more about making the viewer project himself into the characters, to empathize. Our concerns are a bit different: we like to create little human objects with human behavior, and we are, of course, mostly interested in the dark aspects of human nature, which might lead to the impression you’re talking about. Why this focus? Why not incorporate the whole of human experience? R: You have to make a choice somewhere, and we find these aspects of being human the most interesting. The instances where we misunderstand, deceive, betray, hurt, and kill each other are the most relevant and therefore worthy of exploration. You seem very much attracted to traditional storytelling genres and formulae – Safari Monseigneur works with colonialist tropes, Sol Carrelus is a combination of the classic haunted house story and the classic American film monsters, and Le Tricheur is police-interrogation-based caper story. R: We like those forms because there’s a lot of truth in them. They have been used to tell so many stories and have accumulated a lot of cultural baggage that one can make use of. They offer a kind of shortcut to interesting issues, a means of exploring them. I was wondering in this context about the “Maison Close” jam project. Choosing the kind of premise you did – female and male cartoonists drawing themselves interacting in a whorehouse, the former acting the part of the prostitutes, the latter that of their johns – one would assume that one of the most natural themes to raise would be the one of gender roles in comics, as well as the world at large. And I guess you do address this, to a certain extent, but only subliminally. You don’t seem to be interested in going for obvious, or dare I say difficult themes, but rather treat… not subversively, necessarily, but with a certain deadpan irony. R: Well, the “Maison Close” was a collaborative project involving over two dozen cartoonists. We merely provided the premise and drew the scenery in which they had to interact. And we appeared as characters here and there. But really, the individual storylines were left to the participants themselves. Mostly they worked in pairs, creating the story of their own interaction. There was a certain consulting with us, but really, we had no control over the story. Yes, but you chose the premise, the setting, and that in itself dictates a lot of what is going on. It’s an uncomfortable premise. R: Yes, absolutely. We wanted to put the participants in this slightly uncomfortable situation of devising a story in which they participated in this kind of encounter. It was a way of eliciting interesting and difficult choices from them, of making them deal with it. We think that’s more interesting than comfortably letting them do whatever they want, and in any case, we needed a premise to make the project cohere. M: Yes, I had expected her to have a more nuanced view. It seemed a bit of a knee-jerk reaction. Was there an element of provocation in the project? R: Definitely, yes – we of course wanted to provoke the contributors to do interesting work. R: It’s hard to tell you one thing, because each project is different. It usually starts with some kind of idea or concept that we want to try out, and then we develop it from there. Le Tricheur for example, is based on the duet as a model. It’s structured around three duets of characters that interact and reflect each other’s relationships. Often it starts with individual scenes that we find interesting, and only later do we provide a unifying structure. M: Yes, Sol Carrelus, for example, started with a number of separate situations that we found interesting and drew out. By doing this, we gradually developed a set of characters that we figured would work well together. We then pasted up the individual scenes on the wall and began figuring out how we could tie them together, by providing a structure and creating a story. R: Yes, and that phase obviously is more about planning, but it’s not always the case from the start. You both write and draw your comics, and have said that your pages often consist of many separate drawings that are subsequently combined in Photoshop to form the full scenes. Could you describe in more detail how you go about this? R: Well, it’s complicated, and we always try to make it look homogenous, as if it were drawn by one person. [Picks up Le Tricheur] But, for example, here I drew Cravate and Jerome drew Batman, and here I drew Bonnet and Jerome drew Casquette, and then we put it together. I assume you work next to each other? It’s clearly very homogenous work, but do you recognise individual differences between yourselves, that can be used to your advantage? I was thinking that the fact that you are two different individuals might at times be used actively for artistic purposes. Is there a kind of division of labour in this sense? R: This is not something we think it makes sense to talk about. We do the work together. It’s Ruppert and Mulot together. We get this question a lot, and so do Dupuy and Berberian. They refuse to talk about it at all – we talk about it a little, but really it doesn’t make sense. There’s a tendency amongst journalists to want to put things into neat boxes, like “this guys does the characters and this guy does the backgrounds” or whatever, and that’s both rigid and reductive. So it’s not really something we want to talk about in detail.